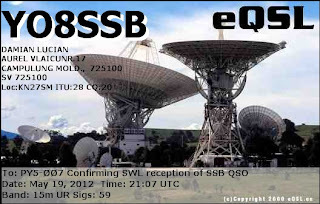 eQSL recebido: YO8SSB, Campulung Mold, Romania, 21 MHz, QSO w/ 9Y4LAS. 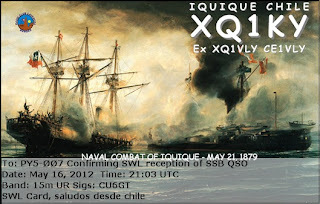 eQSL recebido: XQ1KY, Iquique, Chile, 21 MHz, QSO w/ CU6GT. eQSL recebido: F8DWH, , Bernos Beaulac, France, 14 MHz, QSO w/ PY6RT. 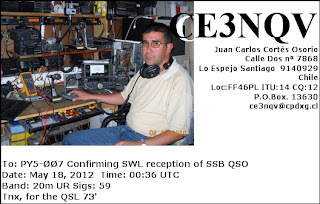 eQSL recebido: CE3NQV, Lo Espejo, Santiago, Chile, 14 MHz, QSO w/ SJ0APS. 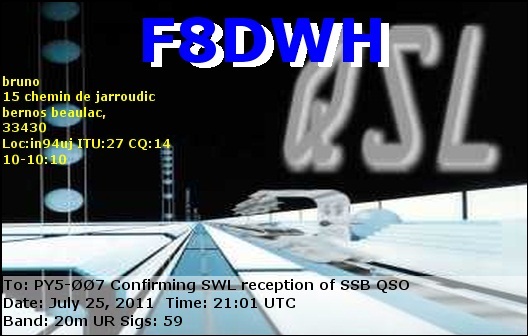 eQSL recebido: PU2SDX, Caieiras, SP, Brasil, 28 MHz, QSO w/ PY4JW. eQSL recebido: PU2SDX, Caieiras, SP, Brasil, 28 MHz, QSO w/ KH6CB. eQSL recebido: PU2SDX, Caieiras, SP, Brasil, 28 MHz, QSO w/ YV6CR. eQSL recebido: IK1WGV, Chieri, Italy, 28 MHz, QSO w/ PY2OF, LU9FFZ, etc. 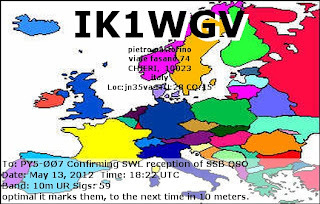 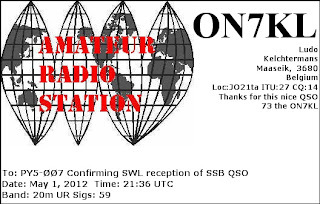 eQSL recebido: ON7KL, Maaseik, Belgium, 14 MHz, QSO w/ ZP5MAL. 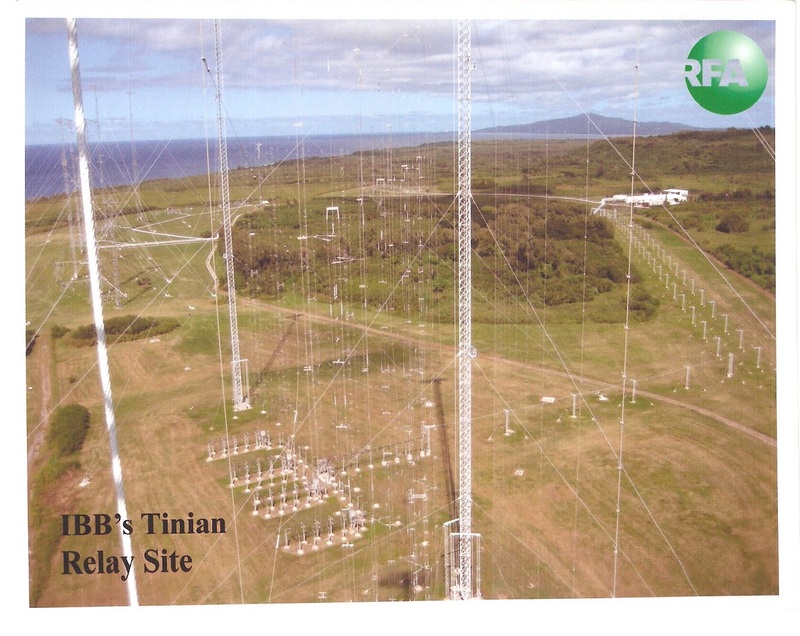 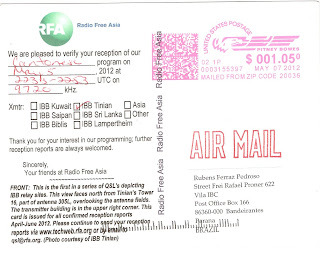 Confirmação recebida: 9.720 kHz – Radio Free Asia – Relay Tinian Island/MRA. 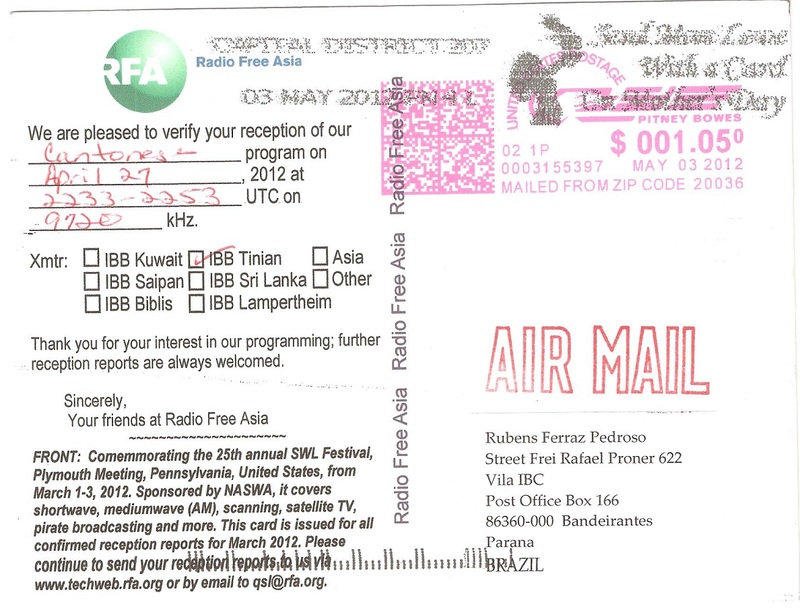 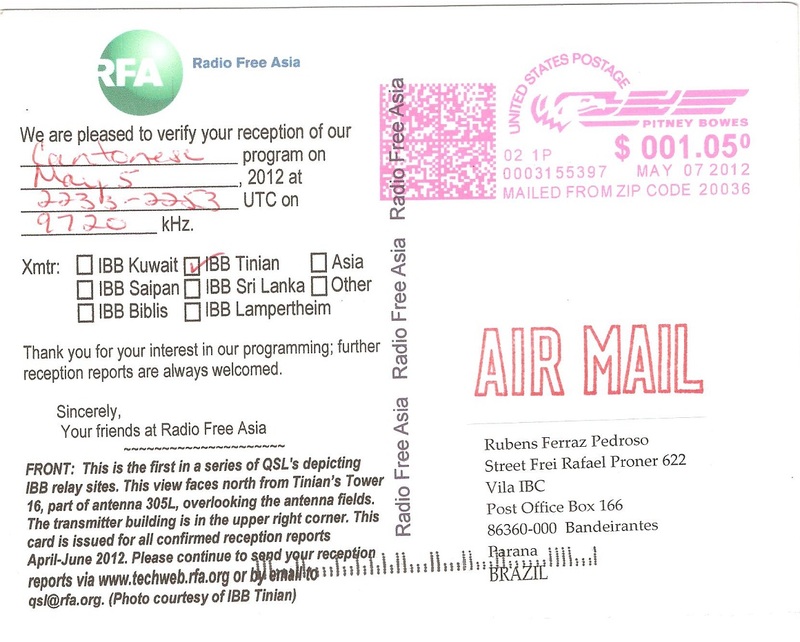 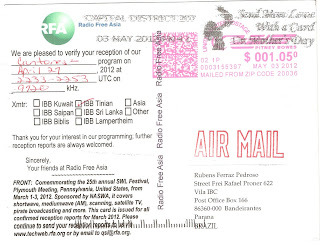 Radio Free Asia, 9.720 kHz – Tinian Island/MRA. 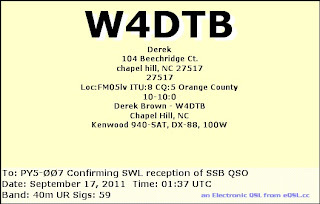 eQSL recebido: W4DTB, Chapel Hill, NC, United States, 21 MHz, QSO w/ KG4BL. eQSL recebido: W4DTB, Chapel Hill, NC, United States, 21 MHz, QSO w/ EA9IE. 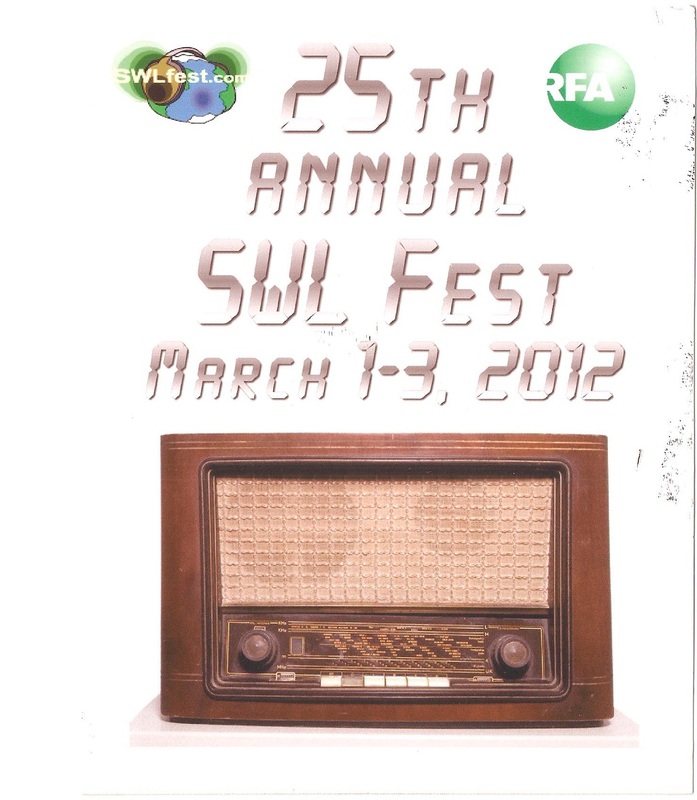 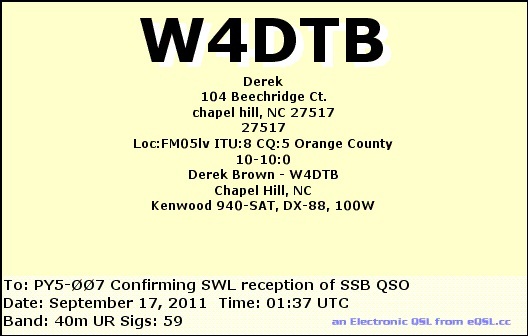 eQSL recebido:W4DTB, Chapel Hill, NC, United States, 7 MHz, QSO w/ LU9ESD. 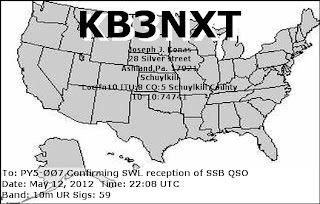 eQSL recebido: KB3NXT, Ashland, PA, United States, 28 MHz, QSO w/ NP3SE. eQSL recebido: NP3SE, Ponce, Puerto Rico, 28 MHz, QSO w/ KJ4ZIT, WB6CMX, KD2AFZ, etc.